After a bit of up and a lot of down, we met the valley of our beloved river Miño again. On the way down we passed through a really rural village with really steep and narrow roads and lots of brambles, and while we were eating them the village church was ringing like crazy. It sounded a bit as if there was a button to make the bell ring, and a cat was constantly hitting the button with their paw. Every now and again, the ringing would stop for a moment, and another church close by would respond in the same way. The two churches were having a chat about us! 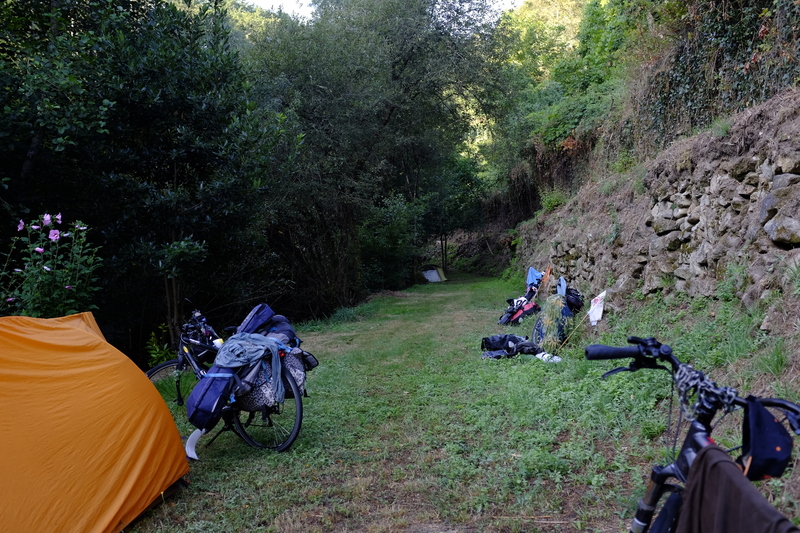 The campsite that night was literally on the border to Portugal. 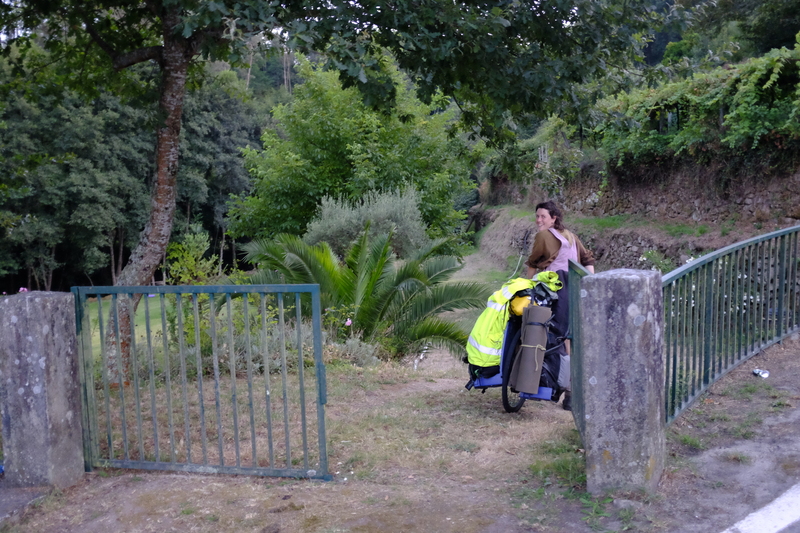 A friendly villager had opened a gate through a fence behind the former checkpoint for us, which led to an amazing lawn below some vineyards, with a water canal falling into a small pool and then mouthing into a stream that passed by the lawn, which also formed the border. It provided the base for some silly jokes:“I just went to Spain to pee.” “It’s already midnight? Well, over there it’s still 11!” The dinner was rich, with the most well-cooked rice of the whole Biketour and some huge bags of bread and lots of bottles of beer that we had dumpster-dived on the way. The next morning some of us stayed for very long, to lie in the sun next to the stream, to have a bath in the pool, and to go for a walk in the small canyon further up the river. 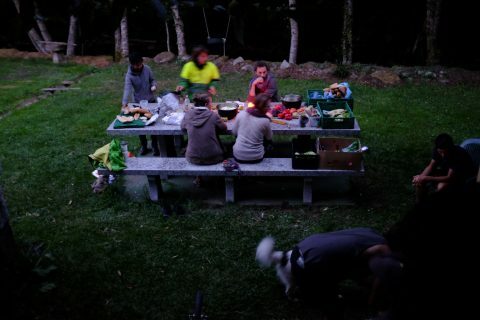 Some left as late as 6 pm, only to understand that the poor man who had shown up every hour in his car looking at us had actually been the owner of the land, waiting for us to leave so that he could finally lock the gate again. But he wasn’t upset, but rather recommended us a nice place to camp in Monção, which would be our place to sleep for the next night. The cycling experience in Portugal was suddenly really different than it had been in Spain. The roads were much more narrow, the surface quality much worse, sometimes cobble stone on the main road, and cycling next to each other was not at all tolerated by the car drivers – in Spain it was even officially recommended. 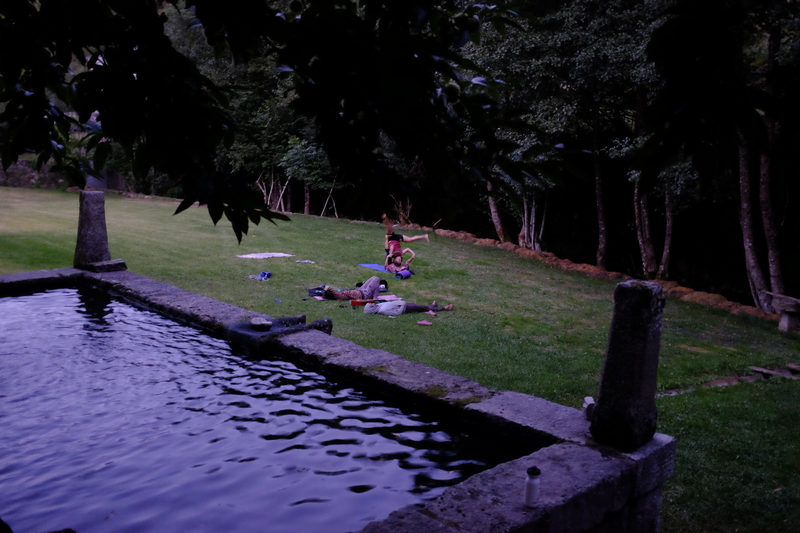 We spent the night next to a castle right by the shore of Rio Minho in the middle of Monção. 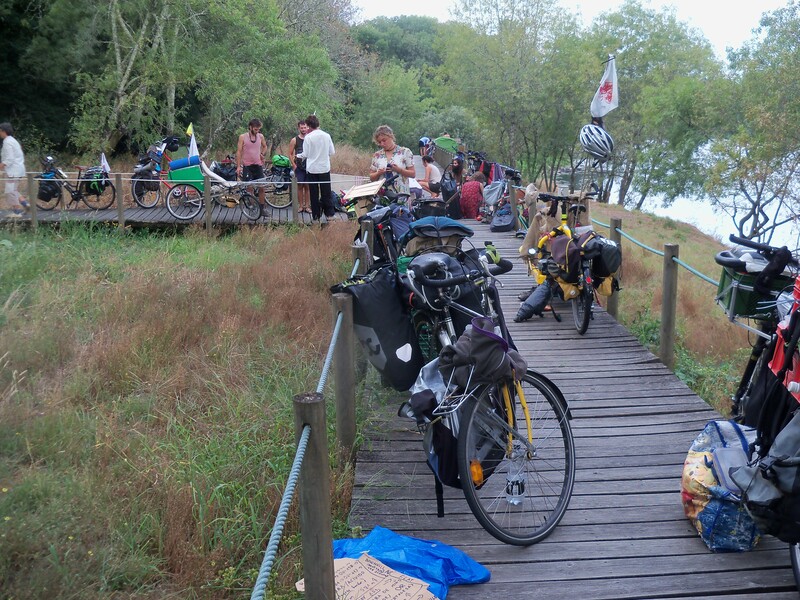 The place was an official recreational area, and lots of people were hanging out there, so we didn’t dare to put up our tents until it got dark and rather blocked the wooden bridge that led to the riverside with our bikes. The open shops on Sunday made planning and carrying food for 40 people much easier, but the workers of the shop were incredibly rude and security came very soon to send us away. They had even called the police, who arrived when we were sitting in front of the shop consuming our haul. It was probably the first police this summer who spoke English, and they made use of this skill to tell us that we should “eat on a table, not on the floor”, and then left again. So across the river back to Spain. First, a bit hilly as always. Then flat for a long time. Then hilly again, and suddenly steeper, steeper, even steeper. At some point so steep that I don’t know how the trailers even made it up there. On top of the hill a message from the scouts: “Sorry!” The only good road across this hill is a motorway that has been built on top of the former national road. When they built the motorway, they thought of the cyclists. Unfortunately, they only thought of them, but didn’t do anything for them. Finally, the top of the hill, with an amazing view onto Vigo.